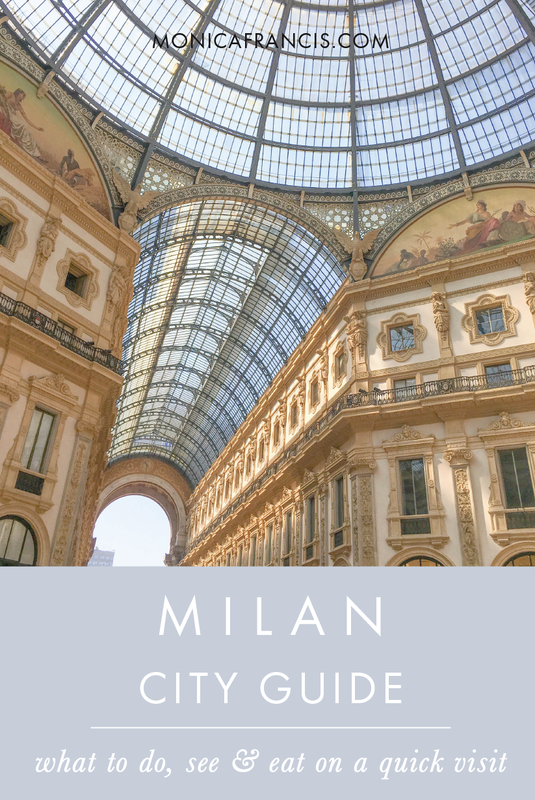 Things to do, what to eat, and where to stay during a short visit in Milan. Milan's Duomo is the third largest cathedral in Europe, and has been the heart of the city for centuries. You can admire its gothic architecture from the piazza, or buy a ticket to go inside - you can even wait in line to make your way up to the roof. There's so much surrounding the Duomo right in the city center, you can see it all in just a few hours. Walk through the neighboring Galleria Vittorio Emanuele II, an incredibly ornate shopping arcade that was built 150 years ago. It's home to Prada's first-ever storefront, and plenty of other fashion houses. While you're strolling between fancy shops and cafés, don't forget to look up and take in the elegant architecture. On the other side of the Galleria you'll find the Teatro alla Scala, home of the opera - it's well worth a visit even if you're not seeing a show. Circle back around towards the Duomo to see the famous square Piazza Mercanti, which was the center of medieval Milan. Seeing Leonardo DaVinci's The Last Supper is an absolute must in Milan. Buy your tickets as far in advance as possible - each small group has just 15 minutes in the climate-controlled room, and demand dramatically exceeds the supply of spaces available each day. Because it's a short visit once you've arrived, I'd suggest making a couple stops along the way. The refectory of the Basilica di Santa Maria delle Grazie is home to The Last Supper (Cenacolo), but the church itself is beautiful in its own right. Before you admire the famous painting, duck into the basilica to see the centuries of artistry - from tiles to frescoes - that have made it what it is today. Across the street you'll find the Vigna di Leonardo, where Da Vinci stayed and kept a small vineyard while he painted The Last Supper at Santa Maria delle Grazie. The private family home opened to the public in 2015 after careful restoration and replanting of the vineyard. Some of the Atellani family still live at the house, more than 500 years after it was given to them by the Duke of Milan. Tip: You can buy a tour ticket that includes both the Vigna di Leonardo and The Last Supper - these are usually available after the Cenacolo tickets are sold out. Once you've seen the major sights, find something new on a visit to the Ambrosian Library or the botanical gardens in the bohemian Brera neighborhood. Entry to the grounds at the nearby Castello Sforzesco is always free, and the park is a beautiful place to spend an afternoon. If you're looking to shop in this fashion capital, the pretty Via della Spiga is lined with high-end brands from around the world. Spend some time at the concept store 10 Corso Como, or stroll down Corso di Porta Ticinese to browse small boutiques and vintage shops. At the Galleria Vittorio Emanuele II in the city center, stop at the famous Bar Camparino to have a classic aperitivo and admire all the Belle Époque details of the space. Venture further afield to Fondazione Prada's Bar Luce, where they serve drinks and small bites. Designed by Wes Anderson, it's got the colors and quirk of The Grand Budapest Hotel, the retro charm of Moonrise Kingdom, and is the perfect place to wear your best Margot Tenenbaum outfit. I'm always drawn to pastries and pretty packaging, so I had to visit Milan's legendary Pasticceria Marchesi 1824. There are a few locations around the city - some with only sweets for sale, others with a small café or bar. Some of my favorite gelato can be found in Milan at Grom! When Aperol and chocolates are no longer enough, find a table at Platina or Ristorante da Giacomo, or walk into the nearest place that looks good - order the Milanese risotto, and it's bound to be delicious. If you're looking for something quick and affordable, Piz serves good pizza. There are plenty of great places to stay in Milan, but we chose the Petit Palais. It's a small, charming hotel with great service and breakfast every morning. If you're looking for a more central location, try the well-reviewed Hotel Gran Duca di York, or the beautiful boutique hotel Antica Locanda dei Mercanti.